The original maps were photographed at Lancashire Archives in Preston. The Tatham tithe map (catalogue no. DRB 1/183) is around 2 metres long. Click here to view the entire map. The "official" version of the schedule is also kept at Lancashire Archives. 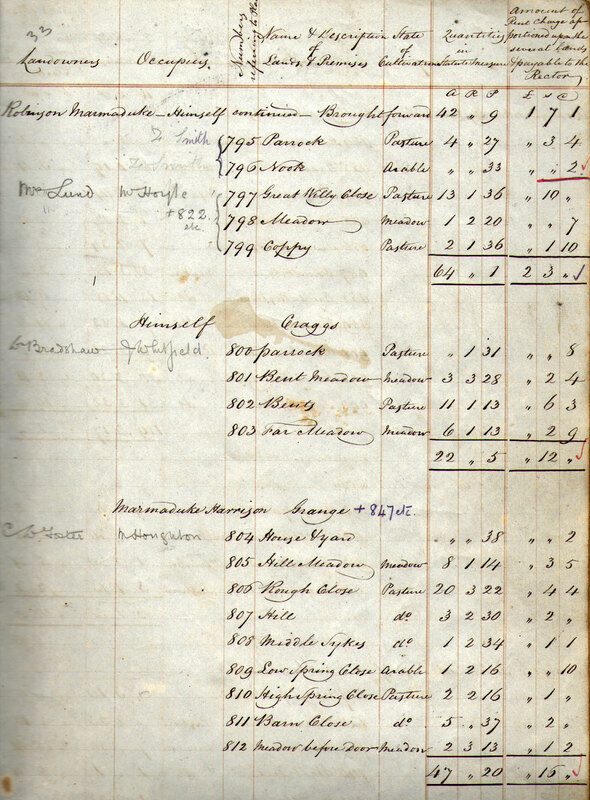 However, the Tatham schedule used on this page was transcribed by a Tatham History Society member from a copy, in his possession, made at around the time of the original. The copy differs in minor respects from the official version (e.g. it includes the name of the holding) and is a curiosity, in that there is nothing to say who made it, or when, or why. Click here to view a sample page. The initial view of the interactive map below shows the historical tithe map for Tatham parish, cropped to the parish boundary. Also included at the southern end of the map, and distinguished by its different colour, is the Botton Head area of Wray with Botton parish, which was moved into Tatham parish in 1974 as part of local government reorganisation. The tithe survey for Tatham detailed 1161 separate plots of land; the Botton Head piece includes a further 22 plots. The background is modern mapping. You can zoom in (up to the resolution limits of the historical maps) to see more detail. At top right of the map is an icon which gives access to three further layers, and allows you to toggle any layer (except the background) on or off, so that you can, for instance, view the tithe map boundaries against the satellite image and see how field patterns have changed. The two "boundaries" layers (red outlines for Tatham, orange for Botton Head) are interactive. When the boundary layer is visible, you can click any plot of land and a dialogue box will appear showing its schedule information. For the full schedule in numerical plot number order, click one of the buttons above the map. Once the full schedule is displayed, you can search it using Ctrl-F. Click the Back to Top button bottom right to return. You can also download the complete Tatham schedule in spreadsheet format. The tithe map is reproduced with permission of the Diocese of Blackburn and the assistance of Lancashire Archives. Tatham History Society is grateful to both, and to Rachel Oldroyd, Teaching Fellow at Leeds University School of Geography, who created the web map below. Transcription of the schedule was carried out by John Wilson, and digitisation of the plot boundaries by Richard Wilson, both members of THS.